You love your kids, you love your family and you love your 2007 WORLD SERIES CHAMPION Boston Red Sox! Now you can combine them all with these exciting new Boston Red Sox Baby DVDs. Featuring Officially Licensed World Series footage of the superstars of The Boston Red Sox, Wally the mascot & legendary Fenway Park along with a grand slam view of the sights, sounds, traditions & colors of The Boston Red Sox, RED SOX BABY WORLD SERIES EDITION combines all the great things you love about the team � show stopping players, amazing homeruns, blazing fast pitches, team mascot, traditions and stadium � with all the things you want your young fans to learn � numbers, letters, shapes, colors, & more. 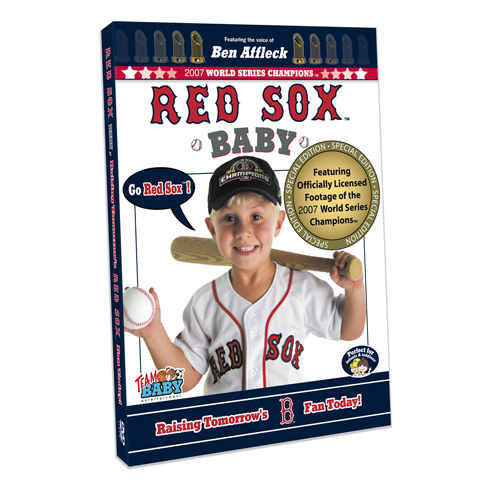 Narrated by proud Red Sox Nation member Ben Affleck & featuring original Team Baby Entertainment music, RED SOX BABY WORLD SERIES EDITION is the ideal way to introduce your love of The Boston Red Sox to the team's youngest fans. Running Time: Appx. 30 minutes.